Quite a night at Coors Field with the Colorado Rockies (and San Diego Padres). As we learned from Zach and Rebecca, get there as early as possible (usually 2 hours before game time is when the gates open) and enjoy the stadium, mostly batting practice if you're into shagging flies. Well this time, it worked. In spades. 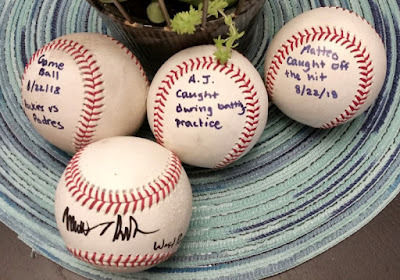 We came home with four baseballs, three from batting practice and one a foul ball in our direction. There were actually five, but Matteo gave that 5th one to a littler boy who just didn't have the height or the reach to compete in the stands with everyone else. 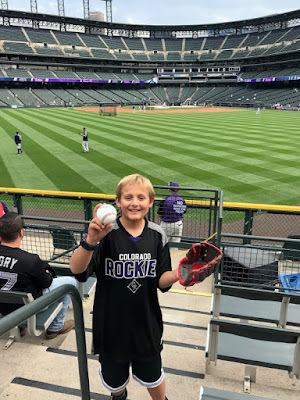 Here's how Tracy tells the story of the ball Jonathan got: "Happy moments in the life of a Chiari Warrior. Last night during batting practice this guy, Matthew, was trying to catch a ball like everyone else. 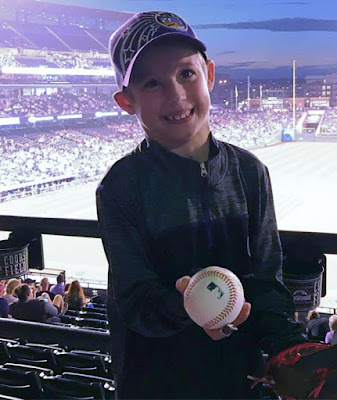 A ball came flying over head and he scaled the bleachers like a bad a**, jumping over them like nothing and caught the ball, he 100% earned that ball but instead of keeping it he turned around, saw Jonathan watching, and gave it to him. Jonathan beamed from ear to ear because he had a BALL, like his brothers. 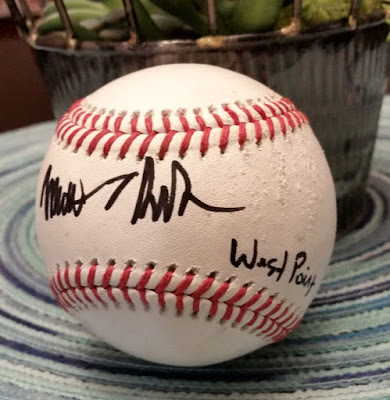 We asked Matthew to sign the ball and he thought we were crazy, but he did!!! Also, he was representing West Point [a graduate], I mean, the dude was great and made this little guy's day. 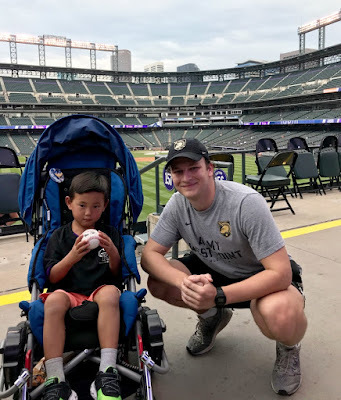 #chiarimalformation #chiarimalformationawareness #tminus13daysuntilsurgery "
Tracy snagged Jonathan's second ball when a foul ball soared into our section of the stands about 10 seats down from David and AJ. It was going pretty good and got through everyone who was there, bounced up into the wheelchair section where Jonathan and Tracy were, and Tracy chased it down. 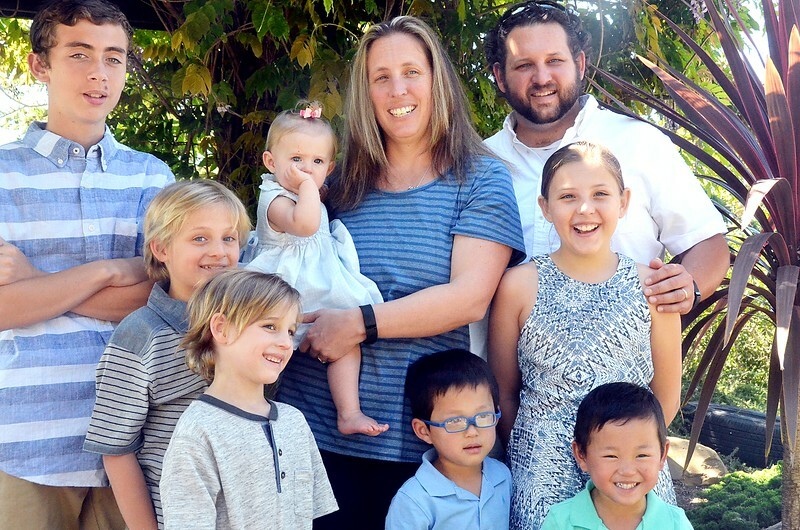 The kid is a ball magnet. Well, so is Matteo. 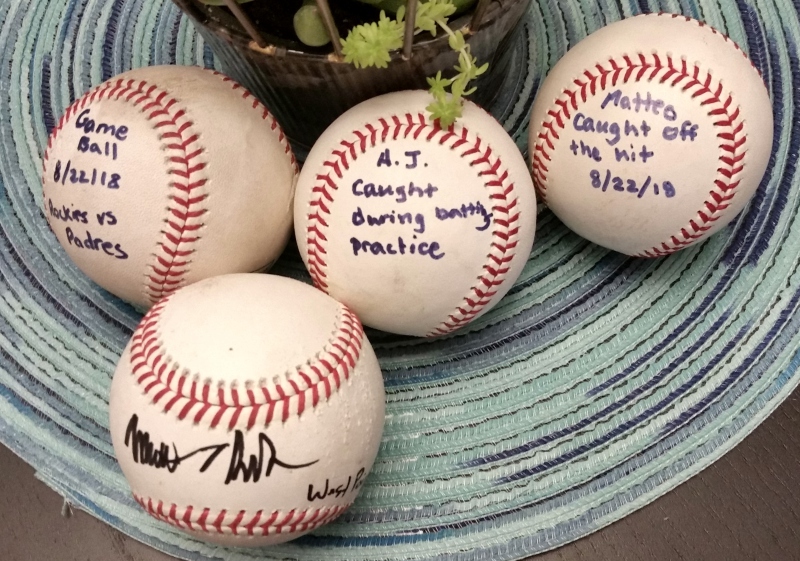 He snagged the other three balls caught during batting practice, let AJ get one, gave one to the little boy (mentioned earlier), and kept one. Rockies won 6-2. BTW, club level is the cat's meow. You can take us out to the ballpark any time! 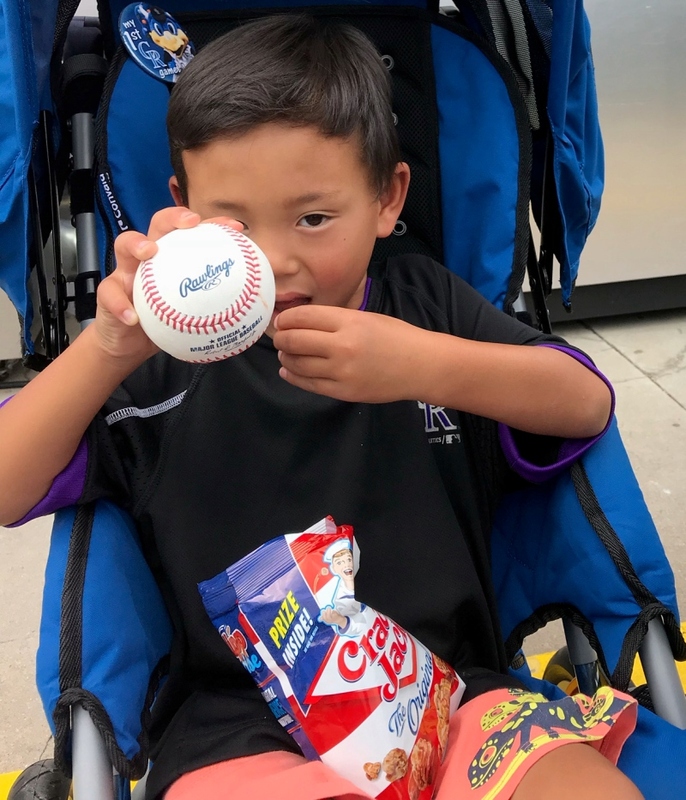 Cracker Jack is a big deal, too.